Every developer knows that WordPress is a free content management system, which started as a simple blogging tool and gradually evolved into something really awesome. It’s pretty much a great fit for almost everything you might need on the net. As an open source project, anyone with advanced knowledge can work on and improve it accordingly. It’s a seriously great platform.One of the best features of WordPress is its support for themes, making it easy to customize the look of your website by using your own code or by installing a theme created by someone else. Of course there are a ton of great free themes out there, but most just can’t compare with their premium counterparts. In this post we’re going to cover some of the reasons why you might want to choose a premium theme, and how to get started customizing it to meet your needs. Using this CMS, you can create websites yourself, but that’s a long and difficult process. We are sure that every developer will agree with the fact. And hiring people to work for you may cost you a pretty penny. Surely there always is another way, and an easier one at that. You can find both paid and free WordPress themes for any kind of project. However, you should think long and hard before making decision about what is more important for you right now: saving money or saving efforts. In a word, there are significant advantages of paid (premium) themes over the free ones. And we are going to list some of the most essential (from web developers’ viewpoint) features below. Theme support: A great advantage of the paid themes is undoubtedly the full support a company provides to the customer. Very often users have questions about the themes they purchased. So, they can just email or chat with a friendly and professional support crew, who is always ready to help. Customization options: Depending on the WordPress theme you purchase, and if it has built-in options, you can easily customize it. All the complicated coding is already done for you, so you shouldn’t have mess with it. Just play with colors, pictures, text, in short each and every element you wish to modify. I think we can all agree that customizing a template is easier and faster than creating a custom theme from scratch. Relatively low cost: This point actually doesn’t need any explanation. Buying a theme for around 50 bucks is more money-saving than hiring someone to make you a custom website (which can cost upwards of $8,000+). Updates: WordPress is constantly improving with each version. Every few months there are major updates for the WordPress Core. Your theme should be compatible with the latest WordPress version, and premium theme developers are highly motivated to keep their themes up to date. These are just a few of the advantages you’ll find with most premium WordPress themes. But whether you choose to create a theme from scratch, purchase a premium theme or use a free one here are some tips on making it your own. If you do decide to buy a premium WordPress theme and believe that it is more profitable and reliable than your other options, you might be asking a simple question: “How do I customize my theme?” Well, that depends. Some themes make it extremely easy for you. The Total WordPress theme created here at WPExplorer includes an extensive theme options panel that includes color pickers, font options, header styles and much more. All you have to do is point, click and save to create a custom looking website in minutes. But, if your theme doesn’t include an options panel you can still make some easy customizations. It doesn’t have to be hard – we’ve got some tutorials that can really help you out. We’ve chosen them specifically for you, and you might want to checkout the YouTube channels of the guys who made theme for even more WordPress tips and tricks tutorials. So, here we go. All of the colors, fonts and styles in your WordPress theme can be found in the stylesheet. We recommend that you learn a bit about CSS before making any tweaks, just so that you can accurately make changes to your theme (tuts+ has a great free tutorial that teaches you CSS and HTML in 30 days). But have no fear, there is an easier way. We highly recommend the Yellow Pencil Visual CSS Style Editor. 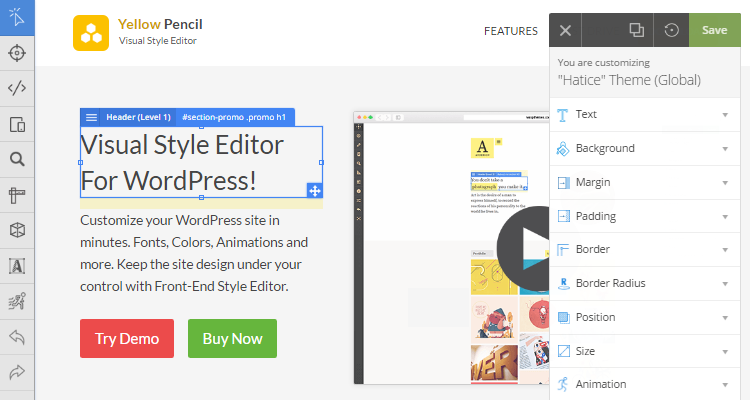 This premium plugin makes it easy to point, click and edit any element of your theme without having to dig into code and is a great choice to customize your WordPress theme. If you’re thinking of doing a major overhaul to a theme, then creating a child theme is definitely the way to go. We always recommend that users create a WordPress child theme to ensure that your core theme remains intact. This way any changes you make stay put when you update your core theme to newer versions. And here’s a roundup of helpful tools to customize WordPress that you might want to have on deck. Both guides are fairly easy to follow along with, so pick your favorite and get going. Well not all helpful tutorials are videos after all. Of course there are TONS of tips here on the WPExplorer WordPress blog, but here are some links to other great posts that you might find helpful as you make changes to your WordPress theme. We hope that the tutorials we have picked were helpful for you and that you now have an idea of where to start when customizing your WordPress themes. If you found an awesome tutorial that we missed let us know in the comments section below. We’d love to hear from you! Its nice that you have narrated how to customize a premium theme! but themes are known to contain excess code and wouldn’t it be more messy if you are tweaking with code that already needs moderation or fluff cutting. Secondly, wouldn’t a start-up be better off on getting a whole custom website made, with unique design, custom features that is more budget friendly than to buy an expensive premium theme? I agree! High prices & quotations are the only things preventing big business owners, let alone startups, from acquiring unique & custom services. Today, majority of service providers are charging top dollar for as much as installing a plugin or changing a background which is very unjust, especially to folks who cant DIY or are not so techie! And this is why ready-to-install themes is the choicest solution!. I admire designers such as you are changing the way of coding, allowing easy customization without hassle! i would definitely check out your total theme! Do share a link! As you explained the benefits of using premium WordPress theme and it has so many advantages. So my aim is to change from Free Theme to Premium!! Good article on customizing WordPress themes. Thanx for sharing it. Hey! you’re going awesome I love to read your article and suggestions. Whenever my buddy ask for best theme I recommend your website. I’ve bookmarked your website please share more and more content with us. Good article on customizing WordPress themes. Thanx for sharing it with us. This article helped me to choose a better theme for my website. I was confused about having a free theme or paid. Advantages mentioned in the article are really informative.